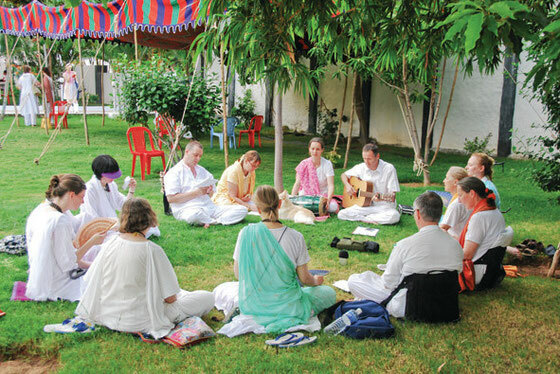 Since Swami Kaleshwar requested us to teach at his soul university in 2006 we have given hundred of bhajan-classes and tought many hundreds of students. We experienced that there is hardly anything for us people in the West that is so overlaid with our own blockages, such as lack of confidence, fears and a strong belief that we are going to be abandoned when we express ourselves in singing. It is a little bit shocking. But at the same time it gives us one of the greatest opportunities to heal! It is a great chance! It is the soul that is singing! That is the open secret! If we let the soul sing, healing takes place. If we turn towards the Divine while we sing, the Divine will turn to us and will bless us! The beauty and quality of singing bhajans is not created by the use of "right" methods, but by the authenticity of the singer. How pure and clear can the soul express itself in the singing, that's what matters. Bhajans adress themselves to the Divine, inviting this beautiful, magnificant energy into our lives. If you want to know more about our training please write us a Mail.